Welcome to Day 10 of the Adjustable Shawls series! Today, we’re talking about adjustable crescent shawls. What makes crescent shawls adjustable, and how does resizing crescent shawls work? 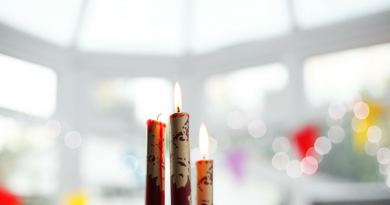 If in doubt, you might consider to consult these resources first. 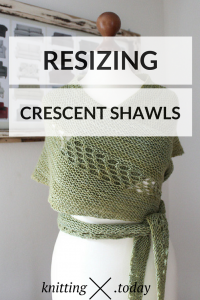 When thinking of resizing crescent shawls you need to consider the construction method first. Resizing short row crescent shawls works differently than resizing crescents worked sideways, for instance. 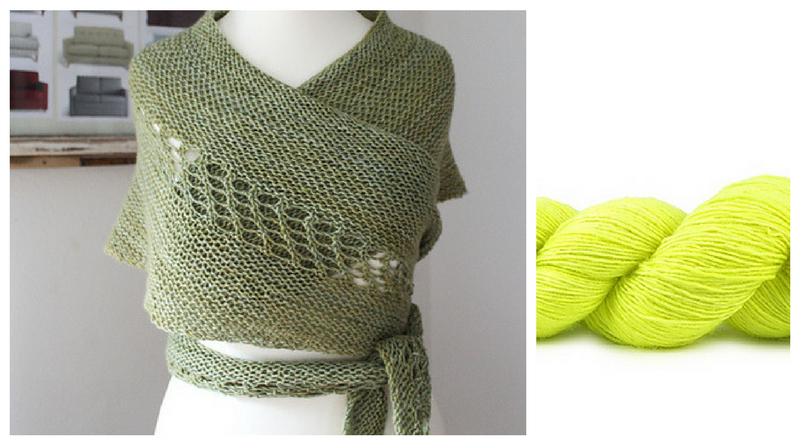 The most easy variant for resizing is the Austrian crescent shawl knitting method. Resizing Austrian crescent shawls is easy: Just knit away until you run out of yarn. Make sure you have enough yarn left for binding off (or working a border in case you decide to do so). The second most easy variant when it comes to resizing crescent shawls is to work them sideways. Adjusting the size of crescent shawls worked sideways without worrying about running out of yarn needs a kitchen scale again (remember the post about your most important tools?). Crescent shawls worked sideways consist of an increase section, a decrease section being the same size as the increase one, and a center section. To make sure you won’t run out of yarn first weigh your yarn before you start and divide this number by three. One third is used for the increase and decrease sections each, the rest can be used to knit the center (straight) section. Resizing short row crescents and winged crescents is possible too, but it requires a bit more effort than those mentioned before. Short row crescents usually are started at the longer edge and decrease in width while short rows are worked. There’s a lot of calculations involved in resizing these shawls so if you don’t feel confident doing the math you might be better off choosing crescents worked sideways or Austrian crescents instead. 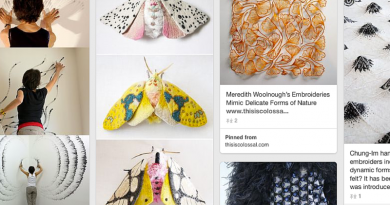 The same holds for winged crescents. Resizing them means recalculating the starting point of the additional wing increases: Start these increases after you have worked approximately half of the shawl’s height. Crescent shawls worked sideways and Austrian crescents are the most easiest construction methods when it comes to resize crescent shawls. Short row crescents and winged crescent shawls need more attention for recalculating size. If in doubt, use the first two construction methods for resizing crescent shawls. Do you have any questions or would like to let us know how it worked out for you? Make sure to leave a comment below!